I learned how to cook in my grandmother’s kitchen, making the thing she made that I loved best: pancakes. I don’t have the recipe and if there was one, it was not written down. She would add all the ingredients to her bowl while I stood on a stool next to her, holding her electric mixer and beating egg whites until they were light and stiff. She taught me how to fold them in, and explained why this was such an important step. It holds all the air, she said. It makes them fluffy. I didn’t really see how that worked, since the egg whites were gone when you folded them in, but I remembered the lesson even as the years went on and I took the inevitable shortcut: pancake mix. Just add water. When I found myself with leftover Squash and Apple Compote, which just cried out to be served as part of a brunch, it occurred to me that pancakes from a mix just wouldn’t do, so I pulled out my 1940’s era pamphlet of Kate Smith’s Favorite Recipes , and found her pancake recipe, which folds in egg whites at the end, the way my grandmother and I used to. So, Mr. Faraway went to work beating egg whites, spilling egg whites, and then successfully beating a second batch of them into stiff peaks, while I assembled the remaining ingredients. In a very hot, lightly oiled griddle pan, these pancakes cook up almost as light as air, or as Mr. Faraway pointed out, as light as angel cake, which was my other favorite thing from my grandmother’s repertoire. The outside browned perfectly and stayed crisp. The pancakes didn’t have much taste to them, making them the perfect vehicle for pretty much anything sweet you might want to add – syrup, fruit compote, whatever. They are not good on their own for the same reason. Author: from "Kate Smith's Favorite Recipes"
Sift flour once, measure, then add baking powder and salt, and sift again. Combine egg yolks and milk; add gradually to flour, beating only until smooth. Add melted butter. Fold in egg whites. Cook on a hot, greased griddle or frying pan. Makes about 10 griddle cakes. 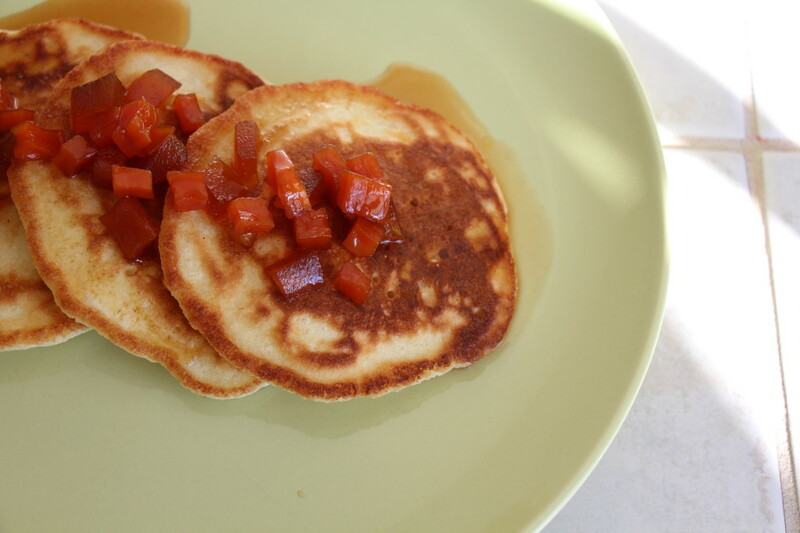 These griddle cakes are fantastically light but also very plain - best served with your favorite syrup or fruit topping. It took me 3 tries to read this post. Every time I started, my lunatic brain saw Kate Smith and broke into “God Bless America”, effectively drowning out any other task until it had finished the complete first verse. Jane and I stumbled on an omelette recipe that does essentially the same thing – folding in beaten egg whites at the last minute. My gosh! I’ll never make them the same old way again. I imagine the transformation in pancakes would be the same… but it’s still not enough to ever make them, I just can’t get them down. Give Mr. Faraway a towel to put under the bowl next time, it’ll help stabilize the bowl and he wont be tempted to whip-sling the bowl into the dining room. Hmm, now I’ll have to try it with eggs. My technique for fluffy eggs is to stir constantly over very, very low heat – but that’s for scrambled, not an omelet. Mr Faraway knows the towel trick! The new dog is using the mixing bowls for food dishes and he was having trouble keeping the eggs in the low-sided pasta bowl with my high-power hand mixer. My fault … but it was fun to watch. Made these this morning and the kids and I loved them. I ended up with mine being a bit darker…old issues with undercooked pancakes. BUT, they are great in absorbing syrup. Cut and pasted the print out into family recipe book.